A musician I have known for years and who is also a long standing client of mine, recently ordered another of my shirts. His request? "I want a lightweight denim shirt that doesn't look too casual, and give it some jazzy style". My response, "Can you give me some idea of what you have in mind?" To which he replied, "Design something, Pammy, Design something !" Was it "jazzy" enough yet? Before sewing further, I sent a photo to my client. His reply was, "Do more with that stripe, I like it." So throwing caution to the wind, I added a wide bias-cut sleeve placket, and "wrapped" the edge of the cuffs with the chambray. 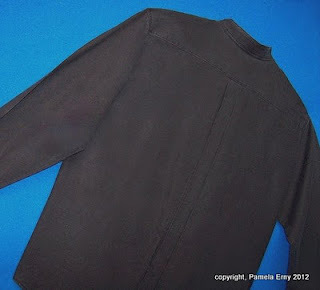 SEWING NOTES: The shirt is finished with the wooden buttons that we carry at www.FashionSewingSupply.com . I turned them over and used the back side of the buttons as the front. 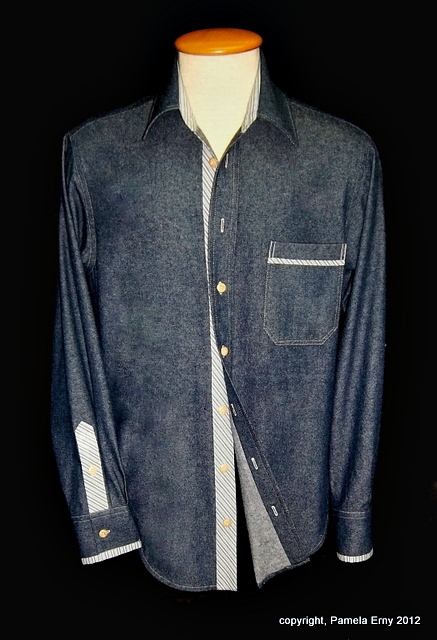 The denim "parts" of the shirt that needed to be reinforced were interfaced with our 60" wide Pro-Weft Supreme Lightweight The chambray was interfaced with 62" wide Pro-Sheer Elegance to stabilize the bias cut pieces, inner collar stand, and the inner cuff. -- Cut the outer cuff the size of the pattern piece. Using contrasting fabric, Cut the inner cuff about an inch wider and about an inch longer than the outer cuff (interface wrong sides of both inner and outer cuff). Right sides of cuff pieces are shown below. --Center the smaller outer cuff on top of the larger inner cuff, Right Sides Together, align (match) one side of the long edges, and stitch a 1/4" seam along that one long edge, as shown below. Make your own Fusible Stay-Tape...without cutting strips! Make your own Fusible Stay Tape...without tedious cutting or trimming! ProWeft Supreme Lightweight Fusible Interfacing on hand. It's So Easy....because ProWeft Supreme Lightweight will tear perfectly straight along the cross-grain, every single time! All you need to do to make your own fusible stay tape is to make a little snip at the selvedge edge, then tear the ProWeft Supreme Light across the width of the yardage. Because ProWeft Supreme Light is so wide, each strip will be 60" long. The tape I made shown in the photo above was "snipped-then-torn" about 3/8-inch wide. 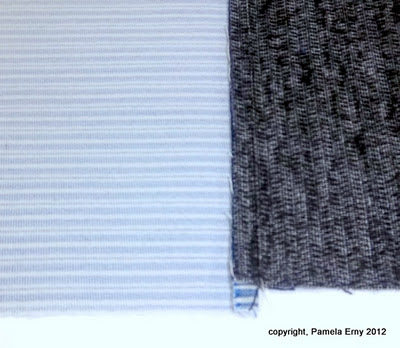 You can tear your strips at any width from 1/4" to 1/2" to use for reinforcing the front edges of jackets (or for wherever you need to use a soft "fusible stay tape"), up to 2-3 inches or more to reinforce jacket hem and sleeve vents, and other tailoring/dressmaking uses. This "Stay-tape" will fuse easily along any straight fabric edge, and because ProWeft Supreme Lighweight is so flexible, you can follow any curve or angle easily (as you can see in the photo above). What makes this Interfacing so special? 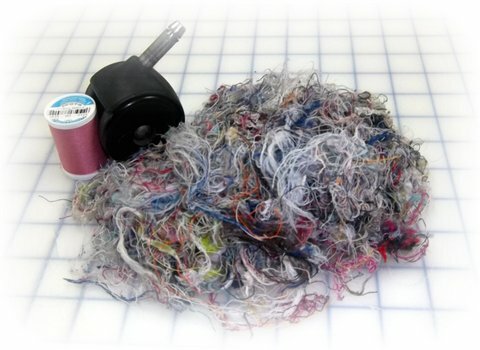 Pro-Weft Supreme Lightweight Fusible has become known as "The interfacing for All Seasons" because it is a knit and woven interfacing combined into one fabulous product that "breathes" because of its unique weave and its specially formulated highly flexible fusible resin. 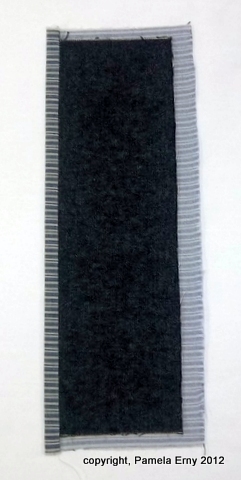 Custom-milled exclusively for Fashion Sewing Supply, it is available in both Natural or Charcoal Black. 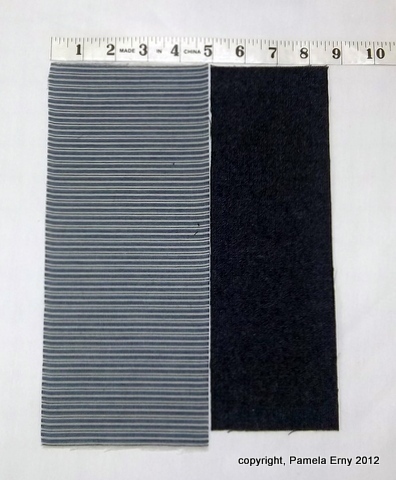 It's terrific for tailoring (especially as a complete underlining for jackets and coats), stablizing hems, wonderful for waistbands, and super for casual shirts made from medium to heavy weight fabrics like denim, chambray, hemp, and flannel. Pro-Weft Supreme Light is perfect for so many types of fabrics and weaves like Linen, Boucle, Silk, Gabardine, Wools, Denim, Twill, and more! 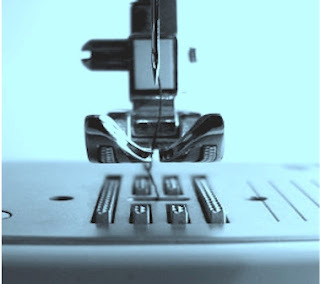 How is it different than other kinds of Interfacing? A woven interfacing like ProWoven Standard has the lengthwise fiber threads (warp) and crosswise fiber threads (weft) woven together. 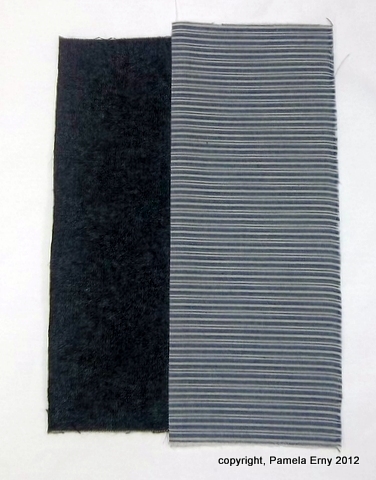 PRO-WEFT Supreme Lightweight is a special kind of "weft insertion" interfacing where the fiber threads are first knit, and then crosswise (weft) fiber threads are woven (inserted) into the knit yardage. 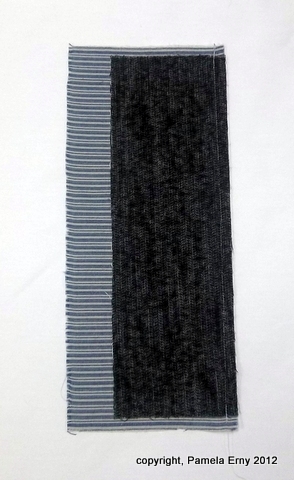 Pro-Tricot Deluxe is soft and has stretch. By combining the properties of both knits and wovens, PRO-WEFT Supreme Lightweight is both totally stable and wonderfully flexible. 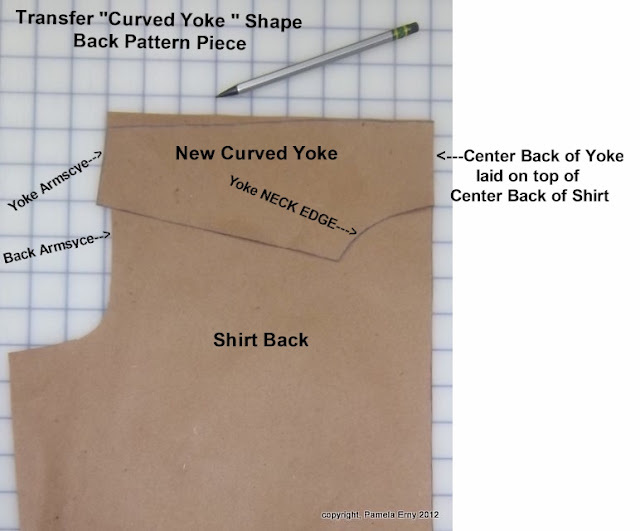 In this tutorial I am going to demonstrate how to refine the shape of a typical "straight-line" Yoke and Back of a commercial Shirt pattern. 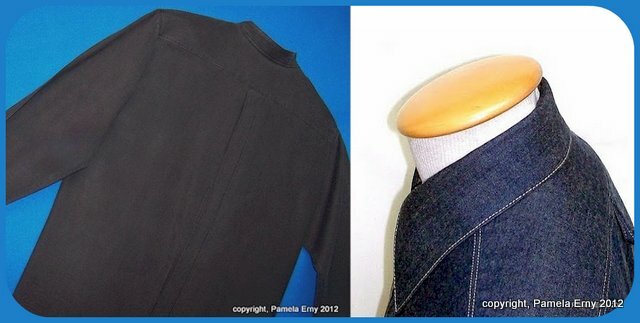 The differences between shirts made from most commercial sewing patterns and my custom-made shirts are often quite subtle, but deliver a big impact on how the shirts look when worn. The shirts I draft by hand have yokes that lay smoothly along the upper back and shoulders with no bunching or ripples. The seam that joins the yoke to the back is contoured...allowing the fabric below to flow over the body gently, rather than just fall from it. Two of the many subtleties that I incorporate into my shirt designs are curved (shaped) yokes and backs. The pattern pieces shown above are examples of a "pattern-in-progress" that I am hand-drafting for one of my clients. 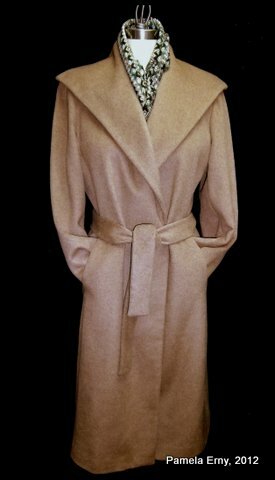 It is based on a draping session done to achieve a truly custom fit and will be fine-tuned before the final pattern is drafted and the fabric cut. Of course, I cannot possibly teach you my custom shirt pattern "Drafting by Hand from Measurements" methods in a blog post. 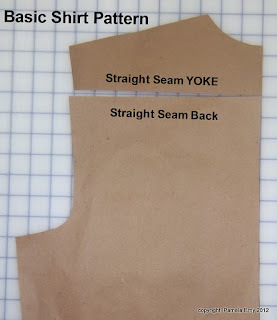 But I can demonstrate how to refine the lines of a commercial pattern that has been drafted with a "straight-line" Yoke and a "straight-line" Back. The commercial pattern used to make these changes should be one that has regular ease, rather than a "fitted" style. 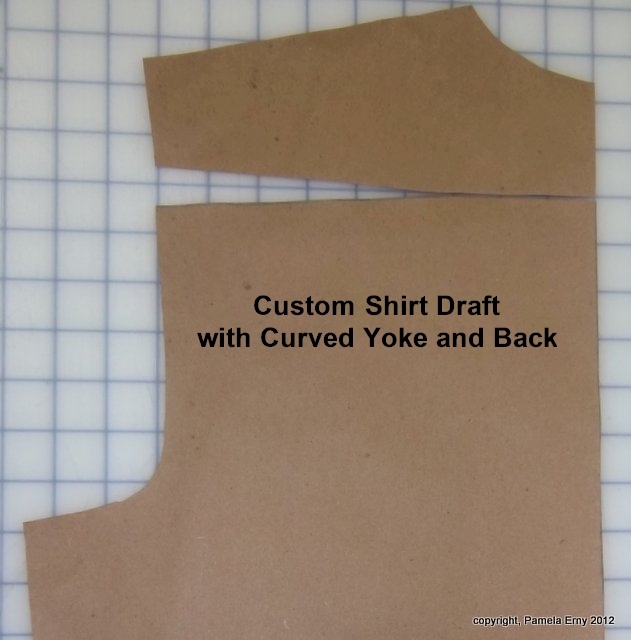 You will need a copy of Yoke, the Back (without the Center-back pleat...fold it out of the way before making the copy), and the Sleeve...ALL OF THEM WITHOUT THEIR SEAM ALLOWANCES. 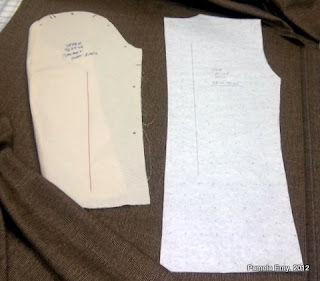 Please note that with the exception of the sleeve, working with 1/2-width pieces is easier when making these changes, and will take less time and paper than making full-width copies of the pattern pieces. The brown paper pattern pieces that you see in this demonstration purposely do NOT have notch markings...because I want you to see how the SHAPES change without extraneous marks. Let's begin with refining the YOKE. As shown below, Mark a point that is approximately at the mid-point along the bottom of the yoke pattern piece. Make a second mark at the side that is a very scant 1/4-inch up above the corner. 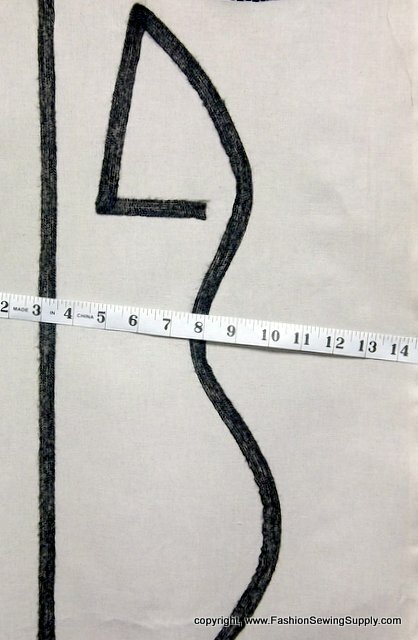 Then using a ruler with a gentle curve, draw a line connecting the marks. If my written directions are not clear, the photo below should be. Please remember this is not rocket science, I have just drawn a gently curved line on the Yoke piece. The key to this entire process is to make small gentle changes to the existing pattern. The goal is to "refine" the pattern in a subtle way, not to make big design changes...we'll do that another time. Lay the New Curved Yoke piece onto the the Shirt Back as shown below....the yoke will be "pointing" down, and center backs are matched. You can see how the straight part of the Shirt-Back extends beyond the new curved Yoke. Now, transfer the curved shape of the Yoke onto the straight part of the back by tracing along the edge of the yoke with a pencil as shown. Next, just as we did with the Yoke...trim off the excess (by cutting along the curved line that was drawn) to finish making the new Curved Back. BUT WAIT! There has been a total of a scant 1/2" removed from the pattern pieces at the armscye edge...making the Back armscye a little smaller. You may be thinking, "OMGosh! What about the SLEEVE ?" Luckily it is as easy an adjustment as the others. 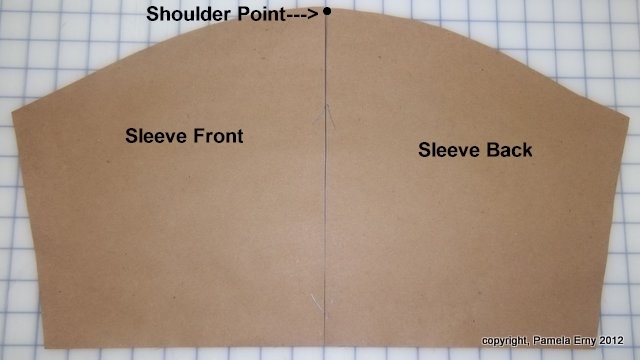 Take the copy of the sleeve pattern that you prepared (I am showing you a shortened version for this demonstration), and mark the shoulder dot by comparing it to the original pattern. Then draw a straight line from the shoulder dot to the bottom (hem or cuff-edge), as shown below. 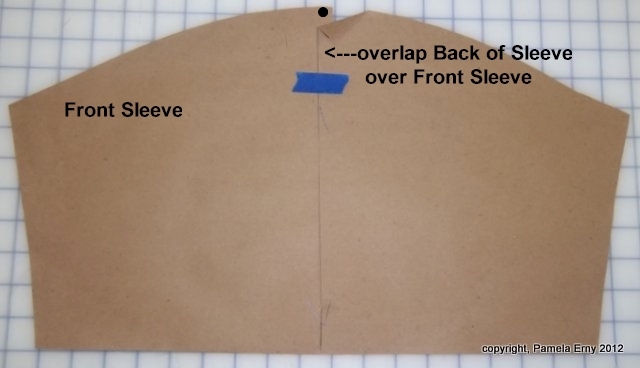 To finish, lap the Sleeve BACK over the Sleeve front...by a scant 1/2" as shown below, and tape to hold. (note- I have folded the Top edge of the Back ONLY so you can see how it was overlapped). 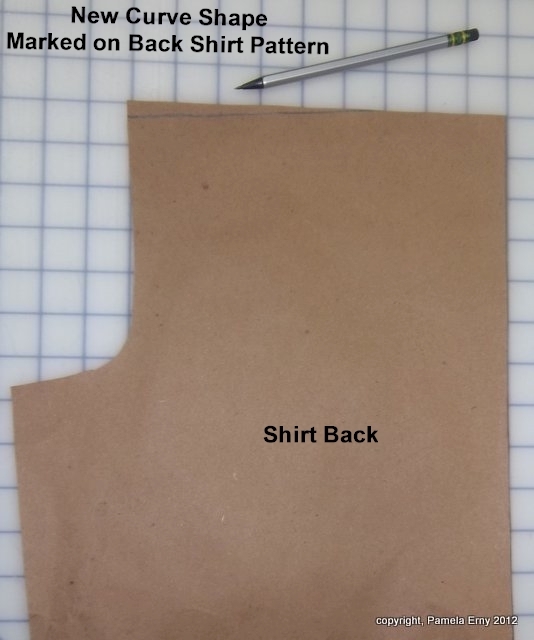 Because we ONLY changed the BACK armsyce of the shirt Body, we ONLY need to change the BACK of the Sleeve. The front of the sleeve stays the same, and the shoulder point has NOT been moved. Remember what I said about Small Gentle Changes? If the Yoke and Back are changed by more than a scant 1/4" each, a total re-drafting avalanche will break loose! 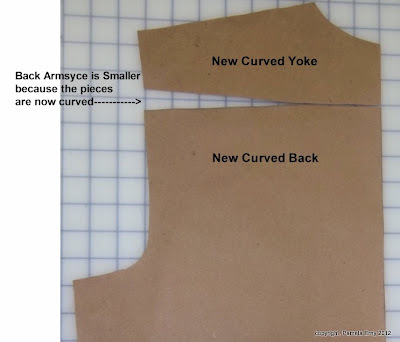 Restore the length of the Back armscye by extending it out at the side seam by a scant 1/2" -- NO SLEEVE CHANGE NEEDED. So we have new refined patterns, now what? 1. 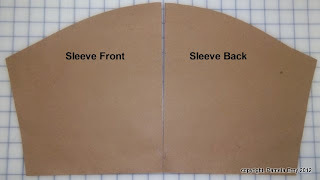 Add the seam allowances and notches to your pattern pieces-- Trace them again, adding the seam allowances. Then use the original pattern piece and transfer any notches/pattern markings including "place on fold" mark, and grain lines. About the notches on the Sleeve--the only one I care about is the shoulder point, and I also make marks indicating the front and back of the sleeve. Why don't I care about the sleeve "ease dots"? Because I do not use them. I match the Shoulder point of the Yoke to the Shoulder Point of the sleeve, then distribute whatever ease there is as I stitch and approach the rounded sleeve cap. 2. Remember, the Center Back pleat was removed from the Back when the pattern copies were made. You may choose to leave it off, or add it back on by measuring the width of the pleat on the original pattern and remembering to add it when you are tracing the final pattern with seam allowances. 3. I know some of you are wondering about the FRONT, aren't you? We have done nothing to the front at all...so we USUALLY do not have to make any changes to it. OK..I hear the gasps of shock and horror from the "by-the-book" pattern drafters out there. Relax...remember, we just made very small very gentle changes. 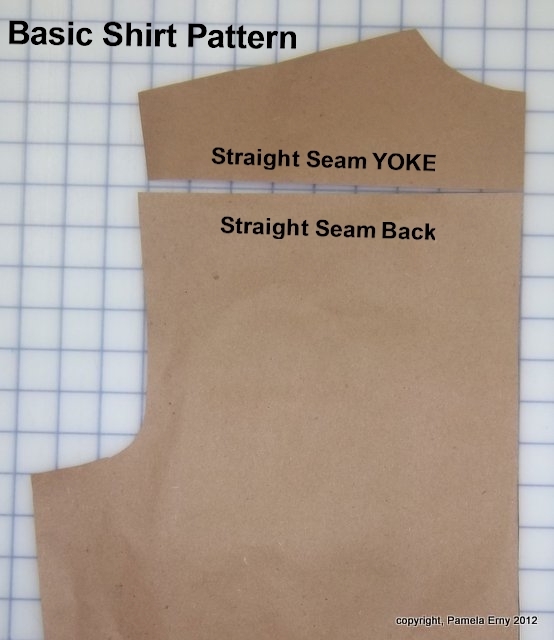 There is a possibility (depending on how the front armsyce of your commercial pattern has been drafted), that the length of side seams of the shirt might not match exactly. So, before you set the sleeve, fold the shirt at the shoulder point on the yoke, match the unsewn side seams from the hem edge up to the armscye and trim IF there is any excess. You may be wondering, "Good Heavens, does Pam do this to every shirt pattern she uses?" Umm..NO. I do prefer curved yokes and curved backs, so I draft my original shirt designs by hand, and include those features as I render the draft. 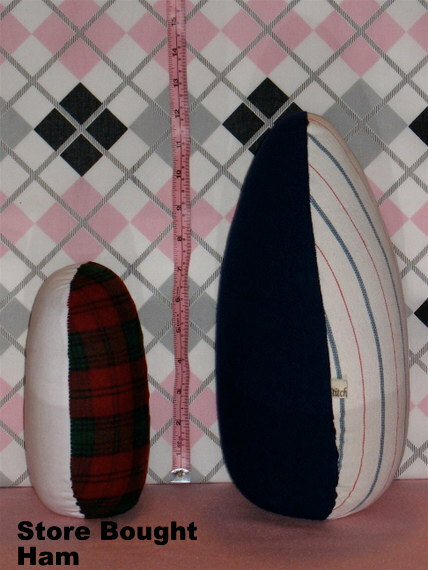 When I use commercial patterns, I usually choose vintage patterns because many of them already have shaped yokes and backs. And yes there are times when I use a vintage or other pattern that has a "straight-line" yoke and back...when I want a more casual shirt silhouette. Hair Balls in the Sewing Studio ! All that thread slowing down my chair really did feel like tangled hair balls! ...not that I have ever personally experienced a hair ball (and you'll just have to take my word on this). My New Bundle of PRESSING Joy! As you can see...this new Ham of mine is so much larger than the ones found at fabric and notions stores. It is professionally hand-made by Sonia at The Stitch Nerd Shop ...and very reasonably priced for it's size. Oh yes, you need one of these...you really do. If you have never had a large pressing ham like this one...well...you don't know what you've been missing. The long length of curve gives you so much better control of pressing darts and princess seams...it makes a big difference. I used to have one just like it during my tailoring apprenticeship, but my EX-husband threw it into the fireplace along with some of my other sewing tools when I announced I was leaving...but that's another story. 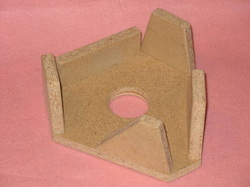 I did try to make one myself from sawdust begged from a lumber mill...but the thing exploded all over my sewing machine and studio when I tried to stuff and stitch it. I have been using a make-shift version of a large ham...but it's not at all the same as this new one. And really, I suppose I could have tried the whole saw-dust thing again...but to me It just wasn't worth trying again when these are so well-made and reasonably priced. I have absolutely NO affiliation with this store. I am just extremely impressed with the quality of this product. So impressed that I just ordered this Ham and Seam-roll Holder...the one I am using now needs to go to the same place that I just tossed my former very ancient (smaller) Ham...into the trash!